On this, the very first episode of ‘Find the Others’, The Lakey Sisters head to Florida. And so we are happy to welcome the Psychedelic Salon’s newest anchors, Alexa and Kat, as they prepare to part ways for the next chapter of their adventures. This episode was recorded just before Kat traveled back to the Peruvian Amazon, where she is currently studying to be an ayahuasquera. She will be recording her portion of ‘Find the Others’ from there. While Kat worked her way across the globe, Alexa journeyed back to the San Francisco Bay Area, where she’ll be recording her part of the podcast. In this episode, they interview Dr. Scott Olsen – author of the international best seller, ‘The Golden Section: Nature’s Greatest Secret’ and owner of one of the largest collections of Amazonian visionary art in North America. The sisters visit with Scott on the last day of ‘The Mysteries of the Amazon’ exhibit at the Appleton Museum of Art in Ocala, FL, featuring the work of Pablo Amaringo and his students from the Usko-Ayar School of Visionary Painting. They talk with him about ayahuasca culture learn more about the paintings in his collection. Following that, they be talk with their parents about their psychedelic experiences and how psilocybin can work as a therapeutic agent. 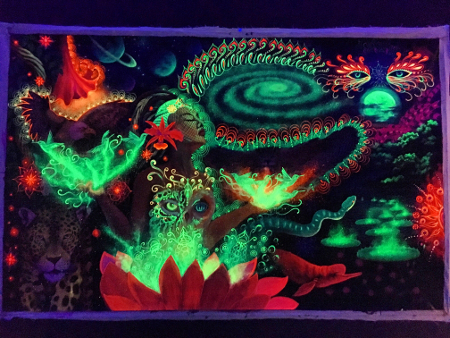 Posted in Alexa Lakey, Art, Ayahuasca, Culture, Kat Lakey, Psilocybin, Psychedelics, Scott Olsen. Both parts of this one really spoke to me. Loved the openness and honesty of this family.